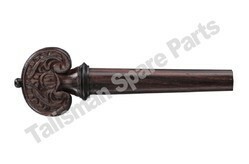 We are offering Rosewood Curving Heart Peg With Ebony Ball & Ring. Available in Violin, Viola & Cello, - Size - 4/4 To 1/32 ( Thin / Medium / Thick ). Available in Ebony wood, Rose wood, Box wood. Laying emphasis on finish and design, our superior qualityViolin Pegs are crafted by the team of expert professionals having vast experience in manufacturing musical accessories. Ideal for all the instruments of the violin family, these pegs are used for tuning the instrument. Available in plethora of magnificent designs, these pegs are offered at reasonable prices. 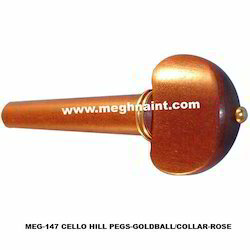 Our organization is offering Violin Peg Hill Sheesham to our clients. These are available in fractional sizes and in different woods like Ebony, Boxwood, Teak, Poshu etc. These are available in variety of attractive designs and are designed for accurate and easy tuning of musical instruments. Customers can be easily availed from the market at most reasonable prices. Violin heart peg are manufactured and crafted only on best woods such as ebony, rose wood or boxwood and are finished to the finest level of workmanship. We are the leading Manufacturer and Exporter of Violin French Pegs. These Violin French / Gold Ball & Collar Pegs are offered by us in bulk and also customized as per the requirements of the customers. Violin French / Gold Ball & Collar Pegs are known for their perfect finishing. These violin pegs are suitable for all the instruments of the violin family and are basically used for tuning the instrument. Our artisans craft these pegs in a variety of magnificent designs which lure violinists from across the world. - Full size violin peg of fine ebony.